Introduction: Establishing an accurate timeline of December 7-8, 1941 radio news coverage is problematic. Some broadcasts simply weren't recorded. Some are crude Memovox recordings, made using a dictation-type machine. Some of the transcriptions are incomplete. Some are missing. Some of the history has been intentionally manipulated by the very corporations who broadcast the event in the first place. Some of the audio files that are now in wide digital circulation first appeared in the 1970s and have either been doctored (lots of cutting and pasting) or were recorded from the original transcription discs in the wrong order (or both). The end result is that it is not possible to recreate a moment-by-moment audio timeline of what the major networks broadcast on December 7, 1941. This is especially true of the notoriously problematic CBS broadcast. 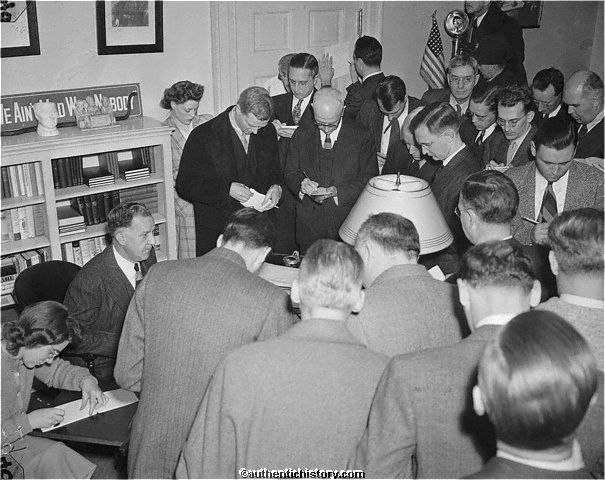 The AHC will attempt to recreate, as much as possible, the radio news events of December 7-8, 1941. 1:23 p.m. EST (7:53 a.m. in Hawaii): The first Japanese bombs fall on Pearl Harbor. 1:28 p.m. EST (7:58 a.m. in Hawaii): from Ford Island on Oahu, this message is relayed to Mare Island Naval Station in San Francisco Bay: "AIR RAID PEARL HARBOR. THIS IS NO DRILL." 1:47 p.m. EST (8:17 a.m. in Hawaii): Navy Secretary Frank Knox calls and informs President Roosevelt of the ongoing attack. 2:00 p.m. EST (8:30 a.m. in Hawaii): NBC Blue begins broadcast of Great Plays. NBC Red begins broadcast of Sammy Kaye's Sunday Serenade (28:41). CBS begins broadcast of Spirit of '41. The kickoff starts the football game game between the New York Giants and the Brooklyn Dodgers being broadcast by WOR in New York. 2:05 p.m. EST (8:35 a.m. in Hawaii): President Roosevelt calls Secretary of State Cordell Hull and tells him not to say anything about Pearl Harbor when he receives the Japanese envoys Nomura and Kurusu (whose audience with Hull, in which they were to break off diplomatic negotiations, takes place about an hour later than planned). 2:10 p.m. EST (8:40 a.m. in Hawaii): The second wave of Japanese attack planes reaches Kahuku Point and deploys over Oahu. 2:20 p.m. EST (8:50 a.m. in Hawaii): Admiral Kichisaburo Nomura, the Japanese Ambassador to the United States, and special envoy Saburo Kurusu delivery a letter to Secretary of State Cordell Hull. 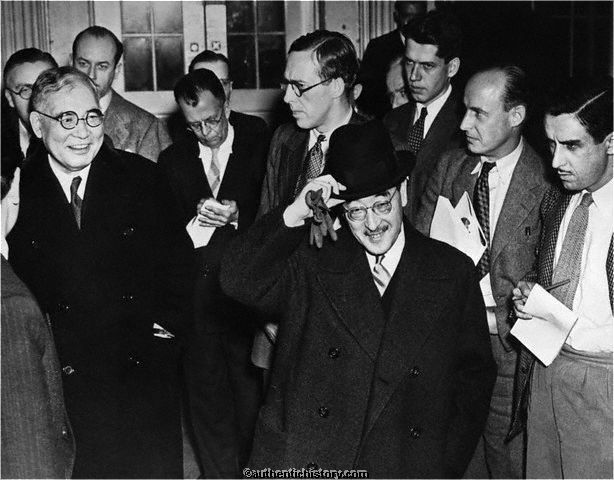 Nomura and Kurusu leave Cordell Hull's office. Although newspapermen had gathered outside the office, none of them yet knew of the Japanese attack. Their curiosity had to do with the ongoing negotiations and President Roosevelt's message to the Emperor. At this moment bombs from the second wave have begun falling on Pearl Harbor. This attack will last until 3:15 p.m. Eastern. 2:22 p.m. EST (8:52 a.m. in Hawaii): From his home, Press Secretary Steve Early calls the three-way press hookup with the Associated Press, United Press, and International News Service, and reads a short statement prepared by his wife moments before: "The Japs have attacked Pearl Harbor, all military activities on Oahu Island." 2:26 p.m. EST (8:56 a.m. in Hawaii): WOR interrupts their coverage of the New York Giants vs. the Brooklyn Dodgers football game at approximately this time. Roundtable was beginning. Over on the Blue network, the Great Plays episode of "Inspector General" was interrupted. 2:31 p.m. EST (9:01 a.m. in Hawaii): CBS leads off their regularly scheduled news program The World Today with the Pearl Harbor story. The rest of the half hour includes reports by Albert Warner in Washington, Bob Trout in London, Ford Wilkins in Manila, analysis by Major George Fielding Eliot, news and commentary by Elmer Davis, and more bulletins. 3:00 p.m. EST (9:30 a.m. in Hawaii): NBC Red: H.V. Kaltenborn gives a quick summary of known facts, then Chats About Dogs airs until 3:15. 3:03 p.m. CBS: The New York Philharmonic Society: This program possibly began a few minutes late, based on a 1999 report by Bob Trout, who was involved in the original broadcast [see The World Today link above]. The significant part of the broadcast is the news update given at the intermission at 3:35 p.m., so it is included below to keep the news chronological. 3:15 p.m. NBC Red : H.V. Kaltenborn: This is a regularly scheduled news program. Several news bulletins come in, including one at 3:24 p.m. announcing that the Japanese have torpedoed an army transport carrying lumber 1300 miles west of San Francisco. [The attack on Pearl Harbor ends about the time this program begins]. 3:30 p.m. NBC Red: Listen America. This intensely patriotic and propagandized program focuses on the importance of nutrition to national defense. Interruptions for news bulletins come at 3:36 (report of naval engagement near Pearl Harbor), 3:49 (Stimson orders army into uniform), and 3:54 p.m. (Churchill and U.S. Ambassador to Britain met). 3:35 p.m. CBS: The New York Philharmonic Society. This program aired in the 3:00 p.m. time slot but only a clip of the program is presented here. This digital file, widely distributed, has been tampered with. Someone has spliced in the 1948 recreation of John Daly's initial PH announcement, the original of which came at the beginning of The World Today broadcast at 2:31 p.m. Nevertheless, one interruption of the concert for a bulletin about an army lumber transport that was torpedoed is authentic (that announcement was made on NBC at 3:24 p.m.). Additionally, at 3:35 p.m., during the concert intermission, John Daly gave a news update. That too is included here. The AHC decided to leave this file intact so that students of history can see how historical myths are created. 4:00 p.m. NBC Blue: National Vespers. Dr. Harry Emerson Fosdick, Professor of Practical Theology at Union Theological Seminary, begins a sermon titled "Finding Unfailing Resources". At 4:05 the program is interrupted for a bulletin that President Roosevelt will meet with his cabinet and then congressional leaders later this evening. At 4:06 there is a live broadcast from KGU Honolulu. After three minutes he is cut off by the telephone company because someone is trying to get through "an emergency call." At 4:09 H.R. Baukhage gives a seven minute report from the WH news room, followed by more bulletins from New York. Coverage returns to National Vespers for about two minutes, then it's back to Washington for more from H.R. Baukhage. 4:00 p.m. NBC Red: Sylvia Marlowe and Richard Dyer Bennett: This music program aired at the same time that NBC Blue aired National Vespers (above). All program interruptions were made simultaneously and thus are identical. c. 4:00 p.m. News from WCAE Pittsburgh. This is a summary of the news up to about 4:00 repeating much of what has been reported earlier. This broadcast also criticizes Americans for their apathy about growing war clouds before the attack. c. 4:00 p.m. CBS: News update. Isolationist Senator Wheeler says, "This means war." Japanese paratroopers spotted in Honolulu. 4:30 p.m. NBC Red: News [preempting The Olivia Santoro Show]. It features a brief report from London, then an extended one from Upton Close in San Francisco. 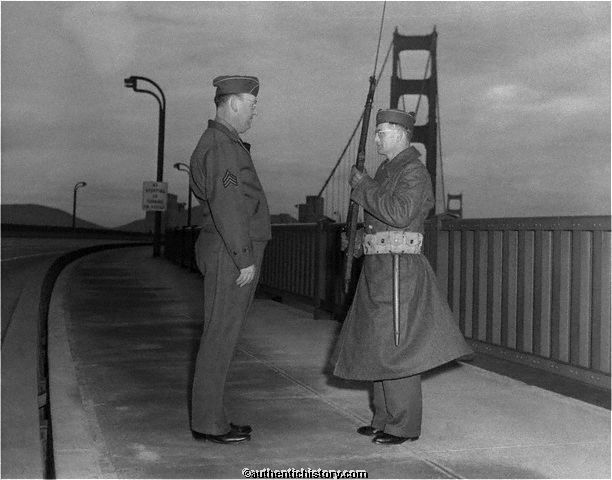 Close speculates on Japan's motives [including possible German involvement]; reports that the War Department has invoked the Espionage Act, and that The Japanese in Los Angeles are being watched, but have done nothing so far. KGB Honolulu gives the first new details in the last 45 minutes, and in the Washington studio senators Elbert D. Thomas (D-Utah), Walter F. George (D-Georgia), and Representative Luther A. Johnson (D-Texas) give interviews about declaring war. 5:00 p.m. NBC Red: Metropolitan Opera Auditions Of The Air: This program is interrupted at 5:14 p.m. for reports from San Francisco, Manila, and New York. Japan has declared war on The United States and Great Britain. The interruption lasts the rest of the program. c. 5:00 p.m. BBC: News update from Great Britain around 5:00 p.m. EST. 5:30 p.m. NBC Red: Family of Five: In this episode about the Nichols family, sponsored by Vicks Vaporub, Mrs. Nichols takes an interest in antique dealing. NBC did not interrupt this program. 5:30 p.m. KDKA Pittsburgh: Sabotage Bulletin. c. 6:00 p.m. CBS: Ford Wilkins from Manila: Manila has not been bombed. Guam is in trouble. The Japanese captured the U.S. Gunboat Wake in Shanghai. 6:00 p.m. NBC Blue: The New Friends of Music: The first eight minutes of the program were pre-empted for war bulletins and for a live report by Bert Silan from Manila. A few minutes later the program is interrupted for a 4 minute update in Washington by H.R. Baukhage. By this time it's becoming clear that Manila had not been bombed as reported earlier. The Japanese are attacking British bases and Guam. 6:00 p.m. NBC Red: The Catholic Hour: There is a short update at the beginning of the program announcing emergency sessions of the British House of Commons, and the Japanese cabinet. At the end of the program is a two minute update announcing that Guam has been attacked and that citizens in Panama with Axis nationalities are being arrested. 6:30 p.m. NBC Blue: Drew Pearson and Robert S. Allen: Pearson and Allen summarize the events up to the moment and give predictions of what's to come. They discuss what will happen if Moscow falls, and predict declarations of war against both Japan and Germany. 6:30 p.m. NBC Red: The Great Gildersleeve: This episode is interrupted five times for very short war bulletins. Most of them have been previously reported. The only new one is that Panama radio reports that a "Jap aircraft carrier" was sunk off Honolulu. 6:45 p.m. NBC Blue: Eleanor Roosevelt: Mrs. Roosevelt had a regularly scheduled Sunday evening program. Tonight the first lady gives her impressions on the day's events during the first four minutes. She then gives her previously scheduled talk on army morale via an interview with Corporal James Cannon from Fort Dix. Leon Pearson and Mrs. Roosevelt then engage in a scripted interview about labor and public relations. 7:00 p.m. NBC Blue: News Roundup. The broadcast includes reports by Mary Brock from Turkey, Grant Parr from Cairo, Fred Bates from London, H.R. Baukhage from Washington, Bert Silan from Manila, and Upton Close from San Francisco. 7:00 p.m. NBC Red: The Jack Benny Program: There are two interruptions to this program. The first one at 7:10 p.m. is a local California announcement about civilians reporting for volunteer duty and a warning about hysteria. The second at 7:21 says that the Japanese have taken over the American Shanghai Power and Light Company. 7:30 p.m. NBC Blue: Captain Flagg and Sergeant Quirt: There are two interruptions to this show. One announces a preliminary estimate of 104 army personnel killed in the attack. 7:30 p.m. NBC Red: The Fitch Bandwagon: There are two interruptions, identical to those from the NBC Blue broadcast of Captain Flagg and Sergeant Quirt above. 8:00 p.m. NBC Blue: Bible Week: A show of "great music, fine singing, and dramatic elements." It is interrupted twice to announce declaration of war against Japan by the Dutch East Indies and Costa Rica. 8:00 p.m. NBC Red: The Chase and Sanborn Hour featuring Edgar Bergen and Charlie McCarthy, and Bud Abbot and Lou Costello: Today's guest is Judy Garland. The show is interrupted once for a bulletin similar to the one broadcast during Bible Week. c 8:00 p.m. Fiorello LaGuardia, Mayor of New York City, orders all Japanese subjects confined to their homes. 8:30 p.m. NBC Blue: Inner Sanctum Mysteries: Today's mystery is preceded by a very short summary of the latest bulletins. No new information is given and there are no further program interruptions. 8:30 p.m. NBC Red: One Man's Family Book 40, chapter 10: This program is preceded by one bulletin. Fiorello LaGuardia ordered all Japanese subjects to remain in their homes. Planes may not carry any Japanese nationals. 9:00 p.m. NBC Blue: The Jergens Journal: Walter Winchell brings us the news. The first minute or so is missing. Winchell repeats mostly the news of the day, but adds some opinions of his own. 9:00 p.m. NBC Red: The Manhattan Merry-Go-Round: This Sunday evening program features music and song while dramatizing an imaginary tour of the night spots of New York City. There are no interruptions or bulletins in this show. 9:15 p.m. NBC Blue: The Parker Family: Starring Leon Janney as teenager Richard Parker. This week, Richard has a new, sophisticated girlfriend named Crystal. Richard's family feels Crystal is having a negative influence on Richard. There are no interruptions or bulletins in this show. 9:30 p.m. NBC Blue: Dear John Book 6, letter 65: This soap opera-type program features Irene Rich as Faith Chandler. In today's episode Faith is staying in a Scottish castle somewhat against her will. There are no interruptions or bulletins in this show. 9:45 p.m. NBC Blue: The Dinah Shore Show: Dinah sings to the accompaniment of orchestra music conducted by Paul Laval. The show was interrupted once at 9:58 p.m. EST to announce that Canada has declared war on Japan. 9:30 p.m. NBC Red: The American Album of Familiar Music: Frank Martin, Vivian Villapieza and others present popular classical songs and music. This show is interrupted at 9:35 and again at 9:57 p.m. to announce that the Netherlands government-in-exile and Canada have declared war on Japan. 9:56 p.m. KIRO Seattle: Local News Bulletins: Just a few minutes before 7:00 local (10:00 pm. EST) KIRO discusses the radio blackout that will occur at 7:00, and the total light blackout that will occur along the entire West Coast, from the Mexican to the Canadian borders, at 11:00 p.m. local (2:00 a.m. EST). 10:00 p.m. NBC Blue: The Goodwill Hour: John J. Anthony, author of Marriage and Family Problems and How To Solve Them, offers advice to people who have relationship and family problems. The show is interrupted twice for bulletins, once at 10:23 to repeat previously announced bulletins and to report Germany's reaction to the Japanese attacks, and once at 10:30 p.m. to announce that President Roosevelt will address a joint session of Congress tomorrow. 10:00 p.m. NBC Red: The Hour of Charm: Featuring Phil Spitalny and the All-Girl Orchestra. The three finalists of a talent contest are announced, and the popular songs of 1942 are predicted. The program is interrupted at 10:06 p.m. for nearly three minutes. Many bulletins are repeats from earlier in the day. The casualty count from Hawaii is still being reported as 104 dead and more than 300 wounded. Washington is described as an armed camp, and military recruiting stations across the country will open earlier than usual tomorrow. 10:30 p.m. NBC Red: Sherlock Holmes: Basil Rathbone and Nigel Bruce star in "The Mystery of Mrs. Warren's Lodger". The program is interrupted at 10:39 p.m. to announce that President Roosevelt will address a joint session of Congress tomorrow. 11:00 p.m. NBC Red: News Program: This is the first real news program broadcast since 7:00 p.m. EST. It features H.R. Baukhage in Washington, Robert St. John, and John W. Vandercook. There isn't much new information, and the casualty figures from Hawaii are still being reported as 104 dead. There is intriguing commentary however. 11:15 p.m. NBC: Special Defense Message: Lynn Stanbaugh, National Commander of the American Legion, outlines the Legion's stand in the ongoing crisis in a speech titled "The Legion Again Answers The Call." The program is interrupted once for a bulletin from an NBC correspondent in Manila that Guam has been bombed. 11:30 p.m. NBC Red: Roundtable Discussion: The program begins with short reports from H.V. Kaltenborn, William Hillman and Max Jordan in New York, Ernest K. Lindsey, Morgan Beatty, Wilfred Fleischer and H.R. Baukhage in Washington, Edward Tomlinson in Chicago, and Upton Close in San Francisco. After 14 minutes of reports, the roundtable begins. 12:00 a.m. CBS: News Program: CBS reads the headlines and stories that are going to be in the morning newspapers around the country. This is followed by analysis by William L. Shirer. c. 2:00 a.m. NBC: News Update: It seems that whomever originally recorded this file dubbed different discs from different times of the day. You can also hear children playing in the background at this person's home. Some of these were cut out but others were left because they are not found anywhere else and are difficult to place in the timeline. Two reports can be placed close to 2:30 a.m. EST because of time references. 9:00 a.m. NBC Blue: The Breakfast Club: This is a typical workday morning radio show with lots of chit chat and music, but nothing of substance. It is interrupted several times for bulletins, most notably for a report from London on Britain's declaration of war against Japan as Churchill is giving a speech. 10:45 a.m. NBC Blue: Music of Reminiscence: The beginning of the program is pre-empted by a report from London of the British declaration of war against Japan announced earlier in the morning. At 10:50 a.m. there is a flash from the White House that the casualty figures in Hawaii are now estimated at 3,000, including 1500 fatalities. 11:00 a.m. NBC Red: Mary Marlin: News begins the program. The casualty figures are repeated, and the White House has announced the loss of "one old battleship and a destroyer, which was blown up" in Hawaii. The soap opera begins and there are no further interruptions. 12:15 p.m. CBS: Coverage of President Roosevelt's Speech Before a Joint Session of Congress and 15 minutes of the House speeches that followed (when, according to House rules, the microphones were to have been turned off). 12:40 p.m. NBC: News coverage following FDR's speech: Unlike CBS and Mutual, NBC did stop their coverage when the House debate began following the President's speech. Coverage begins as the joint session ends. 1:15 p.m. NBC Blue: Let's Sing and Swing: This music program is interrupted almost immediately for coverage of the Senate and House votes on the war resolutions. Jeannette Rankin is the only dissenting vote, which is discussed by H.V. Kaltenborn, and then by Earl Godwin. 1:45 p.m. NBC Blue: News: Bert Silan reports from Manila, Upton Close from San Francisco, followed by war bulletins from New York. 2:03 p.m. NBC Blue: Vincent Lopez and His Orchestra: From the Grill Room of the Hotel Taft in New York City. This program is interrupted once at 2:10 to report that a German reporter's press credentials have been revoked. . Then at 2:24 p.m. EST, Bert Silan reports from Manila that they are under attack by the Japanese. Coverage continues with Silan, Don Bell, and Ted Wallace. 6:45 p.m. NBC Red: John W. Vandercook: Vandercook summarizes the declaration of war on Japan, Earl Godwin reports from Washington, news reports from London, and Bert Silan reports from Manila. Representative Dingell (D-MI) will ask congress to investigate why we were taken by surprise. 9:00 p.m. CBS: Lux Radio Theater: Episode "The Doctor Takes a Wife" is interrupted at 9:30 for news bulletins from New York. 50 unidentified planes are heading toward San Francisco. FDR will talk to the nation in a fireside chat tomorrow night. 9:30 p.m. NBC Blue: News, pre-empting For America We Sing: Bert Silan, Don Bell and Ted Wallace From Manila; Upton Close from San Francisco; Earl Godwin from Washington; bulletins from New York. c. 10:15 p.m. Mutual: News: Report on the West Coast blackout. The FBI in San Diego, with the cooperation of the Mexican government, tonight checked unconfirmed reports of armed bands of Japanese in lower California.